Jim worked for the railroad in South Africa in late 1800’s. James “Jumper” Wide had been known for jumping between railcars until an accident where he fell and lost both of his legs. During his recovery, Jim met Jack and they became the best of friends. Devoted. Inseparable. Jack did everything he could to help Jim after the accident. At first Jim was certain his career with the railroad was finished. Amazingly, the railroad gave him another job as a signalman. 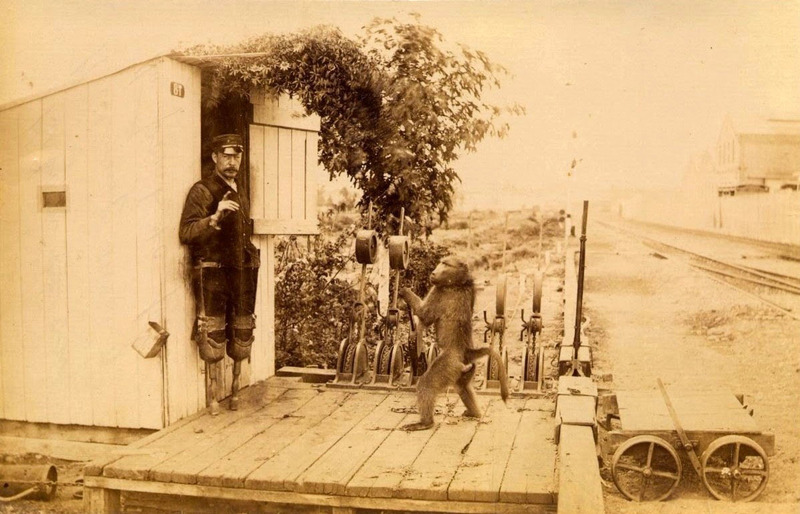 His outpost was to be a lonely little stop more than 200 miles from anywhere. Jack went along to be whatever help he could be. After all, what are friends for? Jim would live in a little wooden shack about 150 yards from the signal tower. It was going to be lonely out there. And there would be many difficult adjustments. But Jack would help for a while, at least long enough for Jim to overcome those initial adjustments of his assignment and his “new normal” as a double amputee. In the beginning Jack stuck around mostly for company. He swept out the shack and pumped water from the well and tended the garden – all things that Jim could not do. There was a little trolley, a single seater that led from the shack to the signal tower. Jack pushed Jim on that trolley several times a day and stood there while Jim operated the big levers in sequence. Eventually, Jack got so familiar with Jim’s routine that he began to walk out and operate the signal system himself. Sure enough, pretty soon, in addition to house-cleaning and the rest, Jack gradually began to take over all the duties for the railroad, even though he was not an employee! There was a lot to remember on that job and a lot to be done. Daily responsibilities at the signal tower included working the levers as well as the tower controls that opened and closed siding switches. But Jack never complained. After all, Jim was his friend. It was the least Jack could do. Word got back to “head office” about all that Jack was doing and was eventually hired by the railroad to work with Jim. For more than nine years Jack kept house for Jim. For more than nine years he made the daily trip to the tower to operate the heavy equipment until Jack died of tuberculosis. In all those years, Jack never made a mistake, never threw a switch incorrectly, never sided a car in error. Not one accident or even a narrow miss was reported on that line. Jack is buried in Cape Colony, South Africa, not far from the outpost where he worked for almost a decade, for his love for a friend. His grave is a silent testimony to selflessness. Oh, by the way, I don’t think I mentioned that Jack, Jim’s devoted friend, who cleaned house and pumped water and tended the garden and manned the switch tower was not a man at all. He was a baboon. After a thorough investigation, the railroad hired Jack. His salary was twenty cents a day, and a half-bottle of beer each week. What do you make of that true story? It reminds me that relationships are vital for us. We are created to be in relationship. Of course deep abiding human relationships cannot be replaced with an animal. But this story illustrates our need for connection. I am not knocking the companionship of a pet, after all we have two dogs and we used to have three! It is clear we made for connection. Cultivate relationships where you are. We are not meant to go through life alone. Today I attended a ceremony for new citizens. My next door Vietnamese neighbor and her 20 yr old son became citizens! 450 people, 56 counties. These new people need friends and neighbors. There were 4 such ceremonies in the county today! What a great day! Yes they do need friends and neighbors just like we do!